After running the Sacramento Marathon in December I vowed to build upon my fitness level to get in great shape this year. Things got busy and if you have been following my blog, you’ll be tired of hearing how the volunteer project my husband and I took on in the spring, was all-consuming – but that it was along with being a highly rewarding endeavour. Finally, after a nine month lapse I raced 5K last Sunday at the Toronto Island Run. Ed Whitlock regularly runs the signature Island 10K to get a sense of where his fitness is at. Even if he is not at the top of his game or has an off day, chances are he will set a record. That day he set a world age-group record for 80 year olds of 42:49. Ed does it again. Congrats! The Island race has been around for 31 years and has built on its success to become a polished, community event superbly run by the Longboat Roadrunners who have operated as a running club for as the race. 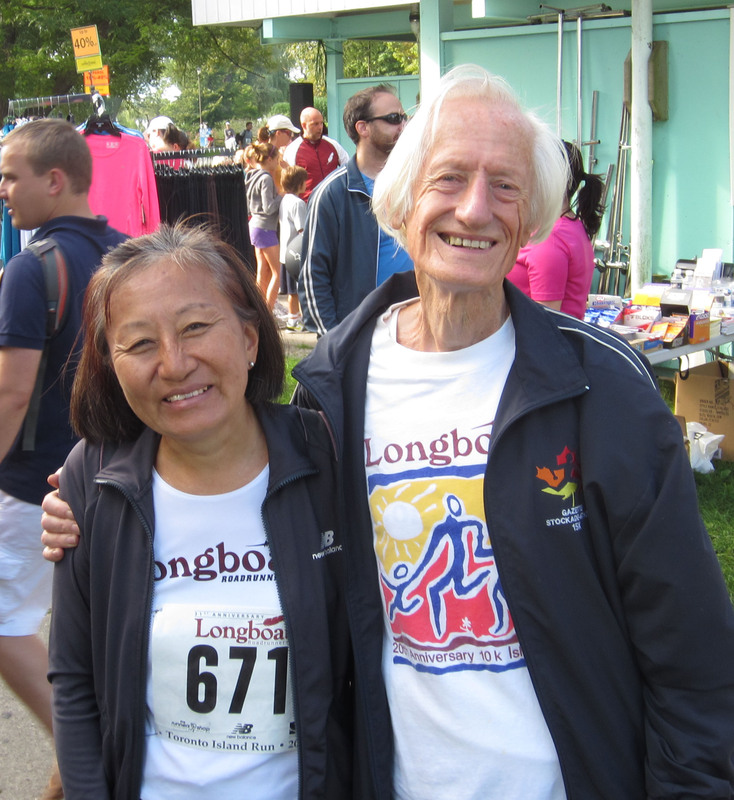 In fact, it was while a member of the Longboat Roadrunners that I met my husband some 26 years ago. The club name honours Tom Longboat who many regard as Canada’s greatest athlete. Longboat was an Onandagan from Ohsweken, Ontario who won the Boston Marathon in 1907 by breaking the previous record over the old 24-1/2 mile course by four minutes and 59 seconds. He was the dominant distance runner of his time. As race day drew near I found myself distinctly lacking motivation and were it not for a commitment I to run the race might have decided otherwise. But, but, but . . . it was, and I did know it would be, just the thing to help focus my training for New York. I’ve been too busy to alter my schedule to attend group workouts and I really needed to be pushed. So I ran 23:04 which was good enough to place 2nd in the masters category. But I really hope to be running a lot faster over the next six months. Although it was the closest I have ever been to throwing up after a race due to having sprinted madly to pick off a runner at the finish line. Our times were the same but I was a microsecond ahead. I surprised myself by feeling obliged to push hard in the last 400 meters and try to catch every runner possible. The weather could not have been more pleasing and we ran into many old friends. For those unfamiliar with Toronto, if you ever visit, a trip to the Toronto Islands is a must. 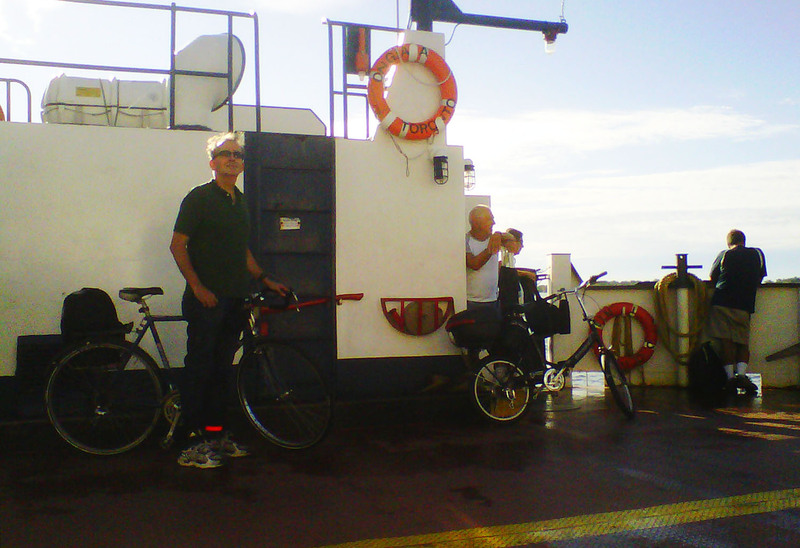 A 10-15 minute ferry ride gets you to a soothing green space with expansive lake Ontario vistas. Toronto Islands - Ya gotta go! Will I ever run under 20 minutes again? Categories: Marathon, Masters Running, New York City Marathon, Running | Tags: Ed Whitlock, Longboat Island Race, Marathon, Masters Running, New York City Marathon, Running, Tom Longboat | Permalink. Recently, I was reminded of the virtues of simplicity while weight training at the local gym. A group of women and one man were involved in what appeared to be resistance training on a small 15- laps-to-the-mile track that circles the weight training area. Some were hunched forward pushing 25 pound circular barbell weights, made slide-able by a towel underneath in an inverted “V” posture that seemed to lend itself to back strain. Another participant was pulling a couple of these same weights with a makeshift rope and belt combination attached to her waist. My impression was that this complicated endeavor had something to do with improving leg strength. While trying to figure out what they might be trying to accomplish, Ed Whitlock’s deceptively simple words popped into my head. “Run as much as you can!” is was what he told me when I asked him for advice. And then another thought, variety for its own sake, is the mother of ridiculous inventions. One place where odd physical challenges are at home is the community picnic, summer camp or team building activities. During this busy summer we’ve had our share of those, along with the hilarity and laughter while taking part. At the Toronto Japanese Community Picnic, despite my protests, I found myself in a three-legged race with a brother whose strategy was to go out hard and if we get in a groove well great and if not . . . Well, you get violently pulled to the ground by your out-of-synch bound legs, experience near concussion and scrape your face as I did and still come up laughing. Of course this was recorded by numerous family members on video, footage I’ve yet to see. My husband and I were the winners of the egg-on-your face award during the egg toss competition. Couples toss an egg back and forth, at increasing distance until disqualified by a broken egg or a grassy landing. My husband got egged by the splatter from the couple next to him and I got splattered by his inaccurate toss, causing great laughter. I have fond memories of summer picnics and park track and field days as they were the scene of my earliest running victories. 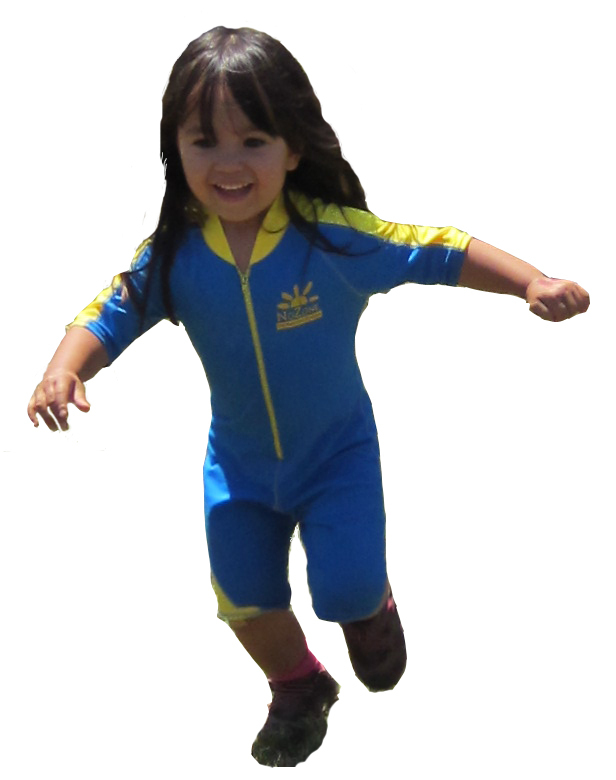 My memory is that my skinny self never went down to defeat in the short dashes we took part in as kids. My husband and I were at a camp in the Muskokas this weekend and took part in various team challenges which included a relay race where you had to spin around five times at the turnaround point, causing utter disorientation on the homestretch, a tug-of-war and wild multi-age soccer and volleyball games. My two camp mornings started with a multi-age run, as all were invited to join me on my laps of the dirt track surrounding the playing field. I ran 5 miles the first morning and 6 miles the next morning with companions dropping in and out. The first part of my run involved going round to each cabin and bunkhouse to do wake-up calls at 7:15 a.m. Never did my morning run feel quite so useful. But going back to Ed’s advice, he’s telling us to RUN not cross-train or push weights around on a track but run. His regime of 2-3 hours a day of running gives testimony to the amazing capacity of the aerobic system to improve à la Arthur Lydiard. If injuries limit how much you can run, that is the time to look for strength and flexibility training to increase your capacity to run. In addition, “as much as YOU can” points to the wisdom of Matt Fitzgerald, author of Mind, Body, Running who advises that to improve as a runner the role of all the other stuff should be to strengthen your vulnerable spots, those the keep you from running “as much as you can”. Apart from taking up an inordinate amount of space on a track meant for running or walking, the complicated weight pulling and pushing activity seems wildly off the mark in anyone’s total fitness package. Grandmaster Ed’s advice points us all in the direction of better running but also vitality and quality of life. Advice well demonstrated by the natural instincts of toddlers as they enjoy their first years on their feet. Categories: Exercise, Marathon, Masters Running, Running | Tags: Ed Whitlock, Exercise, Fitness, Marathon, Masters Running, postaday2011, Role Models, Running | Permalink. I attended a birthday celebration for Ed Whitlock held this afternoon. Ed is most proud of the 2:54 marathon her ran at age 73. His all-time personal record (PR) is 2:31:23 run at the relatively youthful age of 48. While in the 75-79 age group he has run a 3:04:54 marathon and a 39:25 10K. 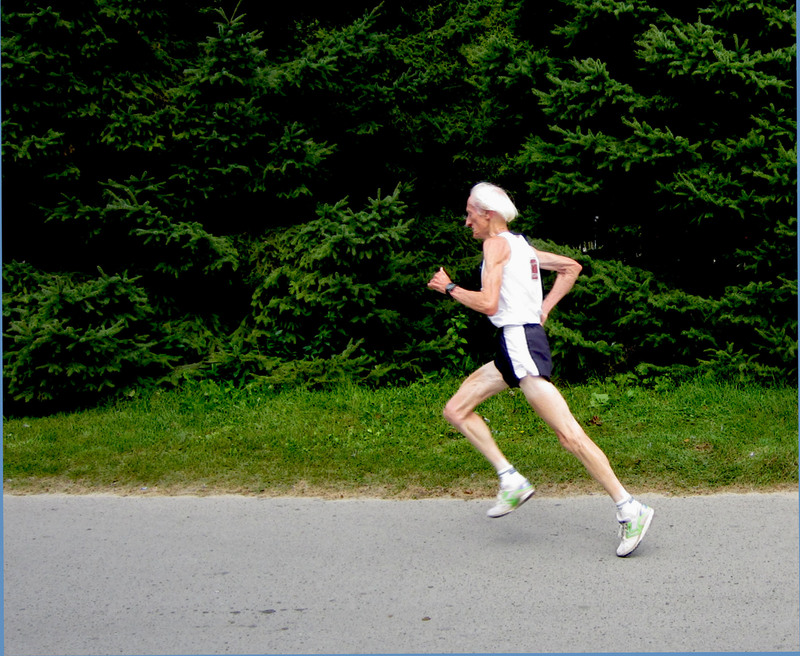 He is still the only 70 year old to have run under 3 hours for a marathon. All were encouraged to share Ed anecdotes. I told the story about the pre-marathon lunch with Ed that I had blogged about earlier this week. Yesterday I had a free cupcake at Starbuck’s to celebrate its 40th Anniversary. Today, I felt I could not say no to a piece of Ed’s 80th birthday cake. We went to a Scottish pub for dinner and my husband insisted that since he had given up alcohol for Lent I should use up my one night of the week for a drink and order a drink given the pub ambience. I’m going to have to rethink my lenten sacrifices as I don’t think I’m off to a good start here. Earlier in the day I ran 14.5 miles but in spite of the good conditions never felt great on the run although I did feel good about the run afterward. Good things happening in the Gala department. My sister and her family are going to be Family-Patron Sponsors and Franklin Templeton is going to buy ten tickets and the Royal York is donating a certificate for a one-night stay to the Silent Auction. WooHoo! Categories: Fundraising, Marathon, Masters Running, Role Models, Running | Tags: Ed Whitlock, Fundraising, Marathon, Masters Running, postaday2011, Role Models, Running | Permalink. Yes, our hometown hero Ed is 80 years old today. Holder of multiple world records, Ed’s best training advice is simple. He once told me, “Run as much as you can.” and the mileage he logged while in top form bears witness to this. His 2-3 hour daily runs in the Milton cemetery are much documented and would have put him at over 100 miles a week as an average. 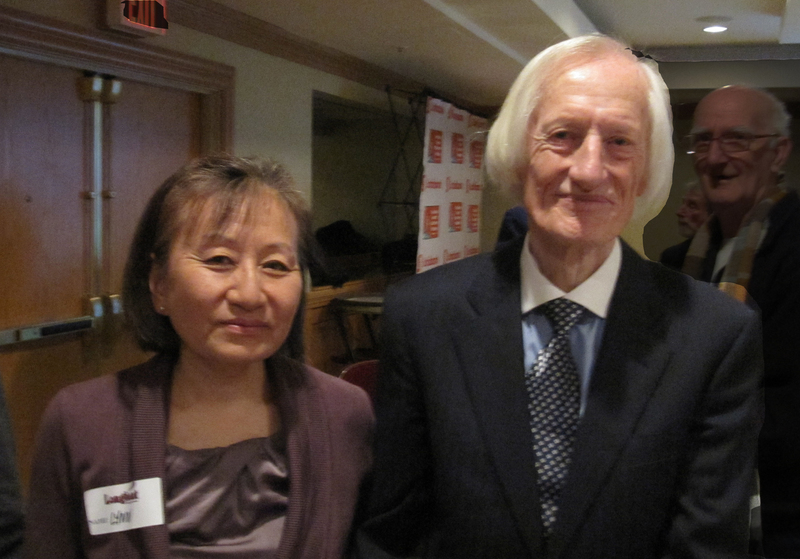 Read more about Ed and his accomplishments in this Running Times INTERVIEW. I once interviewed Ed for a website and found myself quoted on the internet, and most recently in a book on masters runners called Fitter For Life by Ed Mayhew . Unfortunately, that interview is somewhere on the hard drive of an old computer. Those who have been following this blog will know this is the 3rd or 4th time that I’ve mentioned articles stored there. I’ve got that old computer set up on my dining room table but the operating system has disappeared so I may have to take it to a shop to access my mother lode of blog-worthy material. 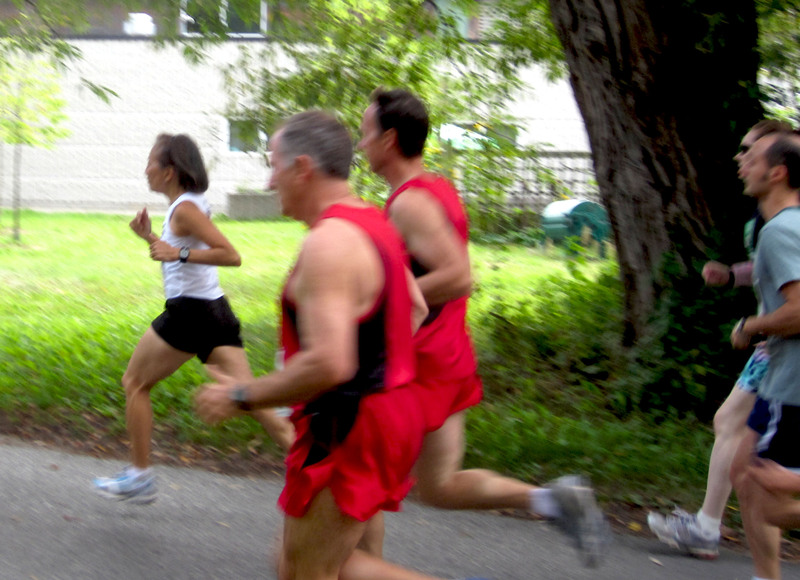 In fall of 2005 I had Ed and Diane Palmason over for lunch the Friday before they were both to run the Toronto Waterfront marathon. At the age of 46, Diane Palmason set a Canadian age-group record of 2:46:21. When I commented to her that this time seemed even more remarkable given that she is the mother of four. Her reply was that it wasn’t so bad because some of her kids were teens at the time. She told me that she would get her miles in by running to and from work. So a working mother of four — a high bar — no? Ed arrived for lunch with a bottle of red and a bottle of white wine, surprising both Diane and I, but we both had a glass. I told Ed that this was the first time in my life, I had ever had a drink before 5 p.m. Ed loves a good bottle of wine and he loves opera and has recommended a few choice performers, performances and vintages. Here is the Scotiabank Waterfront Marathon news flash about Diane’s marathon record attempt that year. Diane Palmason has confirmed that she will be joining Ed Whitlock in this Sunday’s Scotiabank Toronto Waterfront Marathon, and will be gunning for a new Canadian women’s 65+ marathon record on the flat, fast, Lakeshore course. The current mark is 3 hours 51 minutes 44 seconds. Now a resident of Blaine, Washington, Palmason began her illustrious running career in 1976. She was one of the leading figures in Canadian marathoning, and in promoting women’s distance running in the first “running boom” of the 1980’s. Together with Kathleen Switzer, the first woman to complete the Boston Marathon, and Ken Parker of the Ottawa Lions, Palmason was instrumental in bringing the Avon Running Circuit for Women to Ottawa (then her hometown), with the Avon Women’s International Championship Marathon in 1981. Together, they were part of an international movement that culminated in the establishment of the women’s marathon in the Olympic Games, at Los Angeles in 1984. 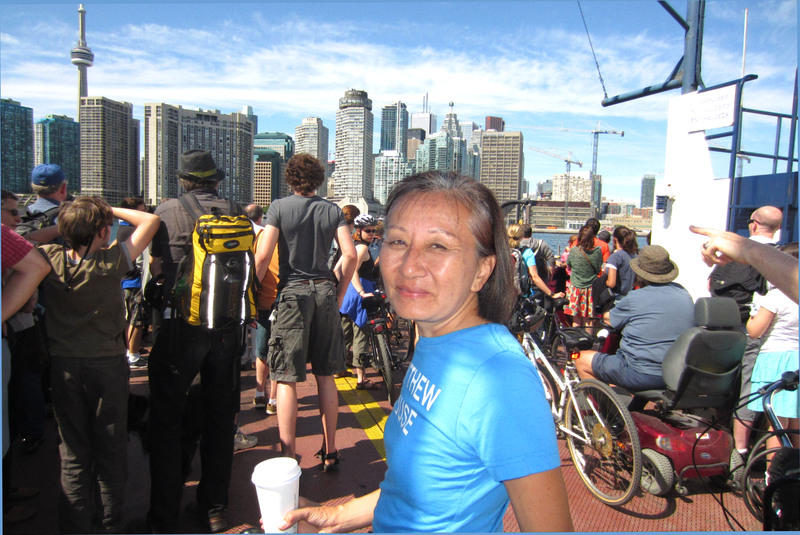 Diane is currently holder of several Canadian Masters marathon records: 45+ (2:46:21) 55+ (3:14) and 60+ (3:16:29). In 2003, she also broke four World Records on the track—400m, 800m, 1500m, the mile, and set new Canadian marks for 100m, 200m and the marathon. Diane will also be speaking at the Waterfront Marathon EXPO in the Metro Convention Centre, Exhibit Hall C, on Front Street, on Friday afternoon at 4:30pm. Her session is on “First Marathons”. On the heels of this luncheon I ran 1:30:19 for the half-marathon, Diane ran 3:55:36.4 and Ed outpaced his Dutch rival Joop Ruter with a 3:02:37. This showdown was billed as the Battle of the Ageless Titans. Good wine, good company, good times, great times! Categories: Marathon, Masters Running, Role Models, Running, Training | Tags: Diane Palmason, Ed Whitlock, Marathon, Masters Running, postaday2011, Running, Scotiabank Marathon, Training | Permalink.